Bolgeir Bearclaw is a Nord warrior and housecarl to Jarl Elisif the Fair of Solitude, never leaving her side when she holds court in the Blue Palace. As housecarl for the newly appointed Jarl Elisif, Bolgeir spends the majority of his life looking after her. He sleeps in the northeastern room on the ground floor every night from 2am until 6am, when Jarl Elisif enters the throne room. He then spends the entire day by her side and only allows himself a quick one-hour meal at 6pm. When the court ends at 10pm, Bolgeir takes the opportunity to relax and just wanders around near the throne room until he heads back downstairs and goes to bed. He carries three weapons, all crafted in Orcish quality, including a dagger and two swords. He wears a set of steel plate armor with matching boots and gauntlets. He only carries a spare belted tunic. 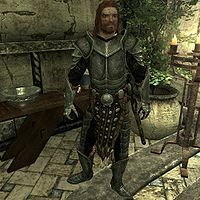 A Nord of few words, he will quickly point you towards the castle steward, Falk Firebeard: "Please address all questions to the Steward, Falk Firebeard." He will also make it quite clear that he is uninterested in socializing: "My duty is to keep the Jarl safe. Not play nursemaid to you sycophants. ", "Keep your weapon out of your hands, and we'll get along just fine." and "The Jarl has advised me not to talk about which court attendants I'd like to punch in the face. More's the pity." Unusually in the game, when he speaks, it says "Bearclaw" in the subtitles, not "Bolgeir". Other Nord are always referred to either by their first name or by their full name. You will receive a Letter from Bolgeir Bearclaw as part of the Bone Wolf Creation, which will begin the quest Let Sleeping Wolves Lie. This page was last modified on 11 October 2018, at 15:39.